It's not really about the boots … or is it? Boot Points is a set of short tales about Violet Parker's purple boots. 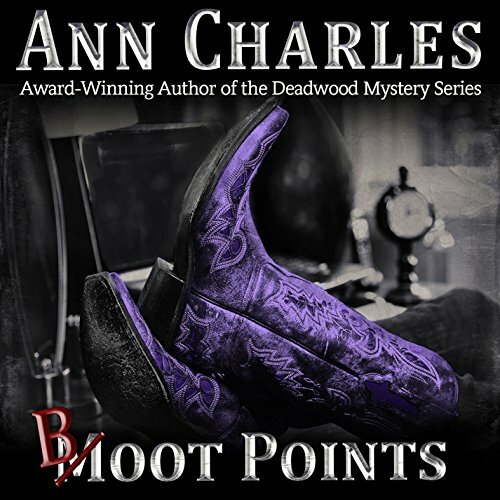 It is set in the story time between the third and fourth books in the Deadwood Mystery series. Each tale not only explains more of Violet's history, but also shows the role each character plays in Violet's life. In addition to this short story, there is a deleted scene from Nearly Departed in Deadwood, the first book in the Deadwood Mystery Series. Also, there are three short stories called "Dancing with Dialogue," "Rainstorms," and "Metro Madness" pulled from Ann's short story vault. This included a couple of scenes with Violet and a few writing exercises the author had done before she was published. While the first vignette with Doc and Violet was cute, nothing else was and the work certainly wasn't worth six dollars. In fact, I have trouble calling it work. It seems like a bunch of practice pieces. And while I might be interested in the practice pieces of J.R.R. Tolkien, the deadwood series has not quite reached the level of the Lord of the Rings yet. This material reminds me of material other authors offer for free on their websites - and on audible. Actually, the free stories other authors offer on audible are far superior to Boot Points - with complete plots and satisfying endings! (See the Chronicles of St Mary's shorts or the Riyria shorts as examples.) While I enjoy the deadwood series, this book of shorts, as well as her other book of shorts, did not give any new information or flesh out the characters any more fully. it is irritating and seems disrespectful to fans that this quality of material was gathered and sold under the auspices of enhancing the deadwood series. So, well I enjoyed the series I am now a bit turned off by the author.